Weekly Wishes - Monday Monday - Baby Doodah! 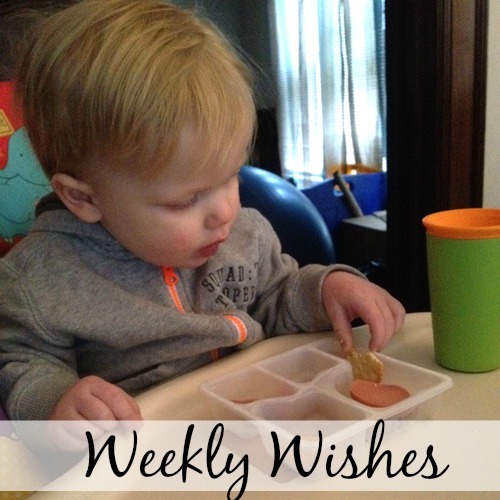 Oh yes, it is Monday and that means, Weekly Wishes! Weekly Wishes is a link-up started by Melyssa from The Nectar Collective. It is a place where you can post and share you wishes and goals for the week ahead on your blog, Facebook page, Twitter account, etc and then link it up on Melyssa’s blog. I LOVE doing this because it holds me accountable for the week ahead. I’ve shared my goals with the world (through my blog) and I know people will read and wonder whether I stuck to my goals. It definitely keeps me honest! I’m super excited to write this post this week, it’s actually Sunday night, I’m writing it early, that’s how excited I am. Why you might ask? Well I have lots of success to share, but we’ll get to those in a minute. First, I figured I’d tell you about my weekend. Saturday I had to work for a good chunk of the day, but it was quiet and I got a lot done, which made the time fly by. When I got home, Emmett was still sleeping from his nap so Seamus and I watched some TV and relaxed. It was lovely! Eventually Emmett woke up and we headed out for our weekly dinner out, that turned out to be a HUGE disappointment. We get stuck in a rut, so instead we tried something new, Campobello’s. I really wanted to like it, but neither of us found it very desirable, even Emmett didn’t eat his ravioli and he ALWAYS eats ravioli. I had eggplant parm, the eggplant was very bitter and the sauce was too chunky for me. Seamus had steak and seafood. He said his steak was decent and his seafood pasta was okay, but not something he was super impressed with. The waitress brought us boxes to take the leftovers home in, we filled the boxes and then left them on the table, hoping no one would run them out to us (no one did). Sunday, was a day full of relaxing, and it was just lovely. Emmett was up early but we got some cuddle time in before we got up and made pancakes, eggs, and bacon, together. After that, I did some laundry, cleaned the bathroom and spent a good long time on the couch until we all went to the gym. Emmett and I went to swimming, and Seamus went for a run. Afterwards, we made a quick stop at Wegmans for some stuff for lunch and dinner, and then back home for naps and relaxation. I spent a good chunk of my evening dozing on and off on the couch, it was heaven! Emmett had his first lunchable today! They’re so bad for you, but once in awhile as a treat won’t hurt. He really enjoyed it! My first wish from last week was to work on getting my chores done throughout the week, so that I wasn’t overburdened on Sunday. Success! I did some laundry on a couple of days, and any time Emmett would take a new toy out, we’d put the other one away. It led to only needing to do a few things on Sunday. Next up was to start reading my new book. Yet again, another success! I began reading A Story Unfinished – 99 Days with Eliot, (that’s an affiliate link) and am just about halfway through. More to come on this book in the future! And finally, I wanted to get my FitBit fixed. It’s not fixed yet, but I did send all of my info to the FitBit people and they’re reviewing my case to see if they’ll send me a full replacement or just replace the back that is cracked. We’ll see! Do some batch blogging. I was reading Chasing Happy the other day, and came across her post about increasing blogging productivity, and this batch blogging really resonated with me. So, I want to take a couple hours at some point this week and just sit down and write. Once I have posts completed, I can add pictures after the fact. I’d love to get ahead! Add some additional posts to my editorial calendar. I got a good start in early January, but I’m starting to run short on ideas. I need to sit down come up with some more post titles and then add them to the calendar. Finish up the book I’m reading, A Story Unfinished. Complete chores ahead of time, leaving Sunday as mostly a rest day. This worked so well last week, I want to stick with it again. Alright, I think that about does it for this week. I’m really excited about getting started on my goals this week! Please join me in linking up at The Nectar Collective. What fun things did you accomplish in the past week? Please feel free to share in the comments below! hello! just popping by from weekly wishes! im working on my editorial calendar this week too, hope you get some productive blogging time this week! Hi Victoria! Thanks for visiting! Good luck with all of YOUR goals this week too.